Oslo, Norway — Most smartphones and other electrical or electronic products contain small amounts of lead, which doesn’t sound like a big problem on its own. But when there are many billions of such products, either in daily use or gone astray, the total sums up to very large amounts of lead – which is a toxic heavy metal. A Norwegean researcher has developed new materials to replace the lead. The environmental authorities in the EU/EEA, the USA and several other countries have agreed to limit the use of lead in electrical and electronic equipment. Products must contain no more than 0.1 per cent by weight of lead in order to be approved for CE marking (link is external), according to current regulations – but there are exceptions, especially when there are no alternative materials to be found. „In practice, it is not possible to limit or stop the use of lead in such products if you don’t have other materials that can deliver the same benefits without being significantly more expensive. Therefore, we at the Department of Chemistry at the University of Oslo (UiO) have tried to develop new materials that can replace the lead-containing materials. Now, we have taken a long step in a right and non-toxic direction”, underlines researcher Henrik Hovde Sønsteby. Sønsteby recently graduated as a PhD, based on his work on making thin films of a material that has the potential to replace lead in electrical and electronic products. The material contains the common elements sodium, potassium and oxygen in addition to the metal niobium and has no known harmful environmental effects. “Strictly speaking, the material isn’t completely new, but it has been difficult to produce it on a form that can be used in applications. But now, we have solved this problem by using the technique called Atomic Layer Deposition (ALD). We are now able to make thin films with potassium and sodium as important ingredients, which is something nobody else has been able to do earlier”, Sønsteby explains. The background for Sønsteby’s research is that we are buying ever more electrical and electronic products, which for a large part end up as Waste Electrical and Electronic Equipment (WEEE) when new and cooler gadgets become available. 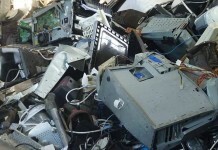 According to the Norwegian Environment Agency, about 85 percent of the WEEE in Norway is recycled and used in the production of new equipment. „The problems with lead pollution are much greater in China and the other countries that produce the electronic products we have become completely dependent on, but that doesn’t mean that we shouldn’t care in Europe. The problem with lead is that the element is absorbed into the body and displaces other chemical substances in such a way that important biological functions are disturbed. Children and pregnant women are especially vulnerable, because lead is easily taken up in bones when growing”, states Sønsteby. Lead is often used in materials that are piezoelectric. which means that they consist of crystals that produce an electrical voltage when pressure is applied. Therefore, these materials are widely used as pressure sensors. The reverse function is also important: If you apply an electrical voltage to such materials, they will expand and for instance give you a tiny engine that can move very small things around. The most extensive use of piezoelectric and lead-based material occurs in transmitters and receivers, where the ceramic compound lead zirconate titanate (also called PZT) has been difficult to replace. PZT contains approximately 60 per cent lead by weight. The thin film that Sønsteby and colleagues in the research group Nanostructures and Functional Materials (NAFUMA) have managed to produce now offers a realistic alternative. The innovative thin film consists of crystals, which Henrik Sønsteby creates by depositing one atomic layer at a time on a substrate made of silicon. The researchers at UiO are far ahead internationally in the use of ALD technology, and research colleagues both far and near have noted that they now are able to make these films with sodium and potassium. „In principle, I believe that we have opened a new door by making it possible to produce new types of materials using ALD. Both cheaper battery technology, superconductors and thermoelectric materials can benefit from this. We have been contacted by several other research groups that are already building on our research”, comments Sønsteby. Henrik Sønsteby adds that there are still some issues that need to be solved before the new thin films can be used in products. „Now, we are able to produce the films in the laboratory, so the next step is to find a way to produce quantities that are large and cheap enough to be used industrially. We must also find a way to produce crystals where all the piezoelectric properties points in the same direction, before the materials can be used as sensors or small motors. However, I can see no reason why this shouldn’t be possible”, he concludes.